The key to confident cycling lies in your powers of observation. The safest and most competent traffic cyclists are not necessarily bold or fast. They are observant. They identify patterns in the chaos and they take advantage of them. One thing most cyclists find intimidating is having a mass of speeding cars bear down upon them. Truthfully, it can be disconcerting to the most experienced and confident cyclist. 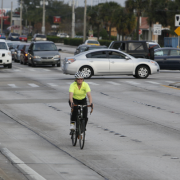 But what the observant cyclist knows is that the mass of cars won’t last forever. Traffic lights create waves of traffic. And between them are gaps with few, or no, cars. When the herd* is let loose, I’ve been established in the lane in clear view of them for a good long time. The motorists in the right lane manage to get their bad selves into the left lane by the time they get to me. They all go speeding by and I still have my lane to myself. When they’re gone, I have the whole road to myself and all is quiet again. Now, in the unfortunate event that I arrive at a red light at Bumby and am first in line, the herd inevitably piles up behind me. I don’t much enjoy that. So I do one of two things. I proceed through on green, then make the next right and use the scenic route (which is a little less direct, but pleasant), or I pull over and wait 10 seconds for them to go away and have the road to myself again. This is a powerful tool unrecognized by most cyclists. When we think with motorist-mind, we think only of getting there ASAP. When we think with cyclist-mind, we should think of getting there via the path of least resistance. What’s 10 seconds when you can have the road to yourself? Many times, I see cyclists cutting corners or slipping around a right-turn-on-red, only to have a wall-o-traffic bearing down upon them. Then they squeeze themselves into the gutter to make up for the intrusion and they get buzzed. Self-induced stress. Ugh. You can learn to read traffic the way a whitewater kayaker reads a river. I learned, by accident, that if I took Nebraska (mile 6) to 17-92, turned left, then right on Virginia Dr., I could get 2-lane Virginia to myself for almost its entire length. I discovered this because I got fed up with the crappy washboard pavement on the 4-lane section of Virginia. But the 2-lane section used to be a point of frustration, too, as impatient motorists would occasionally pass me into oncoming traffic, scaring the bejesus out of all of us. I use a similar technique on Fairbanks Ave. on my way home in the evening. Unfortunately, the traffic light (at Dinky Dock – mile 5.3) is often not long enough to give me a good jump on the herd. New England dumps 2 lanes of left turners onto Fairbanks only seconds after the short green for Dinky. And they are, in the words of Phil Liggett, “in an angry mood” at rush hour. But in some brilliant act of traffic engineering, the upstream timing stops the Fairbanks traffic flow a few seconds before I get a green light. I watch the pedestrian countdown clock and at about 10 seconds I have a shot. Fairbanks is slightly down hill there, so the herd often can’t catch me before I hit the last curb cut for the Mizell offshoot. And I often can’t resist pumping a fist in the air when I beat them there. I’m silly like that. I recently suggested a route to a friend who was looking for an alternative to Palmer Ave., which is closed for construction. The alternate route included using the protection of a green light to turn right into the far left lane of US 17-92 in Maitland, ride one block and turn left at the next light into a network of residential roads. She’d easily get to the left turn lane before the herd got the green light. Route selection and technique are intertwined in smart cycling. Managing gaps works well for making vehicular left turns on multi-lane arterial roads. Sometimes, you can time your merge for a gap by slowing down a little. Remember, you can ride in that left lane for as much time as you need, so merge when you have the gap, don’t wait until you’re 50 feet from the intersection. Realize that no matter which lane you are claiming, overtaking traffic will be deflected into the other lane(s). It’s more difficult to merge when a wave of traffic is already flowing around you. So make that merge to the left lane in the gap and let the traffic flow around you to the right. You don’t have to be fast, aggressive, elite, or any such thing, to ride this way. You need to be observant. Watch the traffic patterns. Think through your moves. When you learn the dynamics of your regular routes, you can use it as a decoder ring for any roads you choose to travel. Always think in terms of being a slow moving vehicle with a right to your space on the road. While you have a gap, establish yourself in the lane you need for your direction of travel, then all you have to do is hold that position when the waves of motor traffic pass. They’ll go around you. 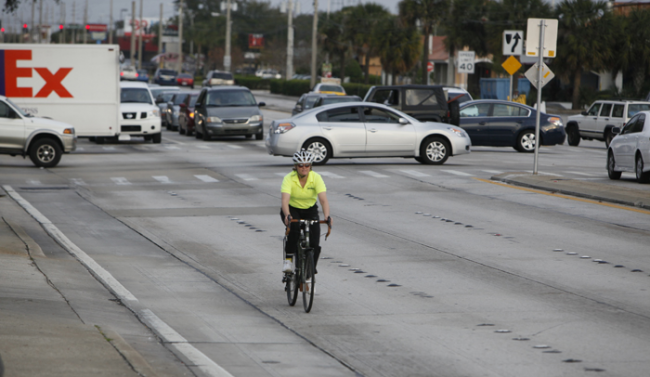 *It’s easy to think of traffic as a mindless herd rather than individual people driving vehicles and making choices. That has cultural consequences I won’t go into now. There is a certain amount of group-think occurring in traffic, but we cyclists can still humanize drivers through our interactions. For the purpose of this post, though, I’m treating traffic as a unit. Smart Moves will be a series of related posts that offer tricks and tips for confident cycling. Palmer is open again as of last thursday! Yay!!! Yessssss! Thank you, Alex. I noticed the sign was gone at Lakemont and was hoping that was the case. Look forwarding to reading more of these. I especially like the corresponding map. 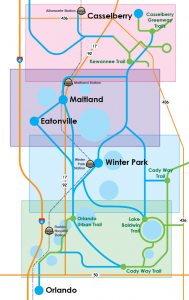 I use the Winter Park Rd to Mead Gardens route too, but there are a few routes through Winter Park in there that look a little more bike friendly than the ones I use. 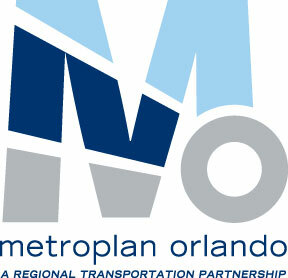 Just a reminder… please share your routes with the CommuteOrlando group (and send them to Mighk for the Metroplan Google Earth map). 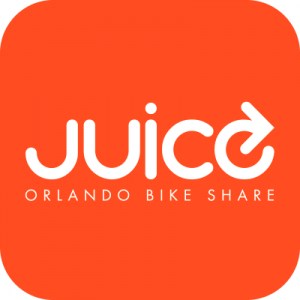 It’s of benefit to new commuters if you share your local knowledge and the tricks you’ve learned on various segments of your route. MapMyRide allows you to do that. Great reading. These are things that I am trying to get across to people in my neck of the woods. Do you mind if I cross post? I welcome cross-posting. It’s all about getting the info out there, empowering cyclists and helping them be smart and safe. This post is a gem that everyone should reread! Combine its tips with artistic and well-timed lane changes, and you will arrive feeling good karma (no pun intended). Can you clarify the strategy turning right from Dinky Donk (Ollie) to Fairbanks? Which countdown timer are you using to determine when to get a jump on the herd? Are you waiting at the green light until the pedestrian countdown timer (crossing Fairbanks) is at 10 seconds? Here in Ohio, many pedestrian signals (and their countdowns) only activate if the pedestrian pushes the button. Do your pedestrian signals activate regardless of pedestrian traffic? I’m waiting at a red light. Watching the timer for crossing dinky. If there is a gap in traffic and the countdown has begun I turn right on red knowing I will benefit from the extra seconds and the time traffic will be stopped when my light turns green. It’s location specific. Not all countdowns coincide with the cycles here either. This one does. The point is that by taking the time to observe signal patterns at an intersection you can make an otherwise intimidating maneuver easier.